reading | Windancer - Stairway to ...Heaven? H.P.Lovecraft, one of my favourite authors. I both love and dread his novels. Science fiction, horror, poetry… I try really hard not to read his novels in the evening, because they are so vivid. And it’s the more fascinating how large his influence is and how vivid his stories run through my imagination, the least amount of _actual_ horror events are actively described in his writings. It’s just the whispers, the sounds, the temperature, the faint scratches and voices, the resemblance of people’s faces, the traces on the ground, the feelings… You read and wait impatiently for things to happen. They never happen, but your imagination makes the best of it. If I ever finish my SciFi novel, I would be the happiest writer on Earth to raise in my readers at least 1% of the feelings and emotions this man does to his readers. For a couple of good months I keep reading through his “Complete Collection” on my Kindle. It advances slowly, as I can’t read as much as I would like to, for lack of time and for multi-tasking with Shakespears’ “Complete Works” and similar ones for E.A. Poe’s “Complete Tales and Poems“. Btw: for those of you with a passion for US history, don’t miss out on B.Franklin’s Autobiography. But: coming back to H.P.Lovecraft, I’ve recently re-viewed The Whisperer in Darkness. Another movie which made it quite nicely to how I imagined Lovecraft’s characters at the time I’ve read in The Whisperer in Darkness – short story. I need to see the Call of Cthulhu – silent film – inspired by the story with the same name – of H.P.Lovecraft’s. Also, not to forgot about Metallica’s Call of Ktulu – inspired by, yes, the same H.P.Lovecraft! For those who know already what this is about, this post won’t bring anything new. Personally, my limited knowledge in history and culture makes me enjoy (re)discovering some interesting facts of the past. 302 and minds by direct experience or necessary demonstrations. A nice website summarising facts around Galileo and his creations in the Galileo Project. Or…whatever number. I am learning how to bargain. [Michael] Hello! What’s up? What do you want to do this evening? Shalom! Ma-shlomeh? Ma-at rotsa laasot ha-erev? [Rachel] Good evening! I’m fine, thanks. I don’t know… I want to do something. I want to eat diner. What do you want to do? Do you want to eat diner with me? Erev tov! Beseder, toda. Ani lo iodaat… Ani rotsa laasot mashehu. Ani rotsa leehol aruhat-erev. Ma-ata rotse laasot? Ata rotse leehol aruhat-erev iti? [M] Yes, I want to eat diner with you, but not this evening. I want to eat diner with you tomorrow’s evening. Is it ok tomorrow? Kin, ani rotse leehol aruhat-erev itah, aval lo ha-erev. Ani rotse leehol aruhat-erev itah mahar-ba-erev. Ze beseder mahar? [R] Tomorrow it is not ok. Tomorrow evening is ok. When do you want to eat diner tomorrow evening? 8 o’clock? Mahar beseder. Mahar-ba-erev beseder. Matai ata rotse leehol aruhat-erev mahar-ba-erev? Be-sha-a shmone? [M]No, not 8 o’clock. Later on. 9 o’clock or 10 o’clock? Lo, lo be-sha-a shmone. Az. Be-sha-a tesha o be-sha-a eser? [R] 9 o’clock it’s ok.
[Rachel] Good day! How are you? [Michael] I am fine, thanks. How are you? [R] Ok. Do you want to buy that? Beseder. Ata rotse ze liknot? [M]Yes. How much is it? [R]It is 10 Sekels. Do you have 10 Sekels? Ze ole asarah Shkalim. Yesh-leha asarah Shkalim? [M]Yes, I have 10 Sekels. But… 8 Sekels? Kin. Yesh-li asara Shkalim. Aval…shmone Shkalim? [M]Ok. But I don’t have Sekels. I have Dollars. How much is this in Dollars? Sababa. Aval ein-li Shkalim. Yesh-li Dollarim. Kama ze ole be-Dollarim? [R]It is 2 Dollars. Not 1 Dollar. Ze ole shneym Dollarim. Lo Dollarim ehad. [M]Ok. Here it is: 2 Dollars. Thank you. Sababa. Hine shneym Dollarim. Bevakasha. Pentru ca tot ma ramolesc cu numai literatura job-related, incerc in disperare sa mai prind si alt gen de carti. In ultima vreme m-am achitat relativ ok de task-ul asta personal: am terminat Dune, tocmai am terminat prima carte din Foundation (Asimov) – Kindle, Printesa Gheturilor – paperprint. Si incep O scurta istorie a romanilor povestita celor tineri – Djuvara – paperprint. Finally got to lesson 7 and learnt how to say where I wanna eat. [Michael] Hello. How are you? [Rachel] Hey. I am fine. How are you? [R] Shalom. Ani beseder. Ma shlomha? [M] Ok, thanks. What do you wanna do? Do you want to eat something with me? [M] Beseder, toda. Ma-at rotsa laasot? At rotsa leehol mashehun iti? [R] Yes, I want to eat something with you, but I also want to drink something. [R] Kin, ani rotsa leehol mashehun ithra, aval ani rotsa lishtot mashehun. [M] I also want to eat with you. Where do you want to eat? [M] Gam-ani rotse leehol itah. Eifo at rotsa leehol? [R] Not here. At a restaurant at the hotel Hilton on Rabin street. There. [R] Lo po. Ba-misada be-malon Hilton, be-rehov Rabin. Sham. [M] I also want to drink something, some wine, or some beer. When? What hour do you want to eat at? [M] Ani gam-rotse lishtot mashehu, ctsat yayn, o ctsat bira. Matai? B-eize sha-a at rotsa leehol? [R] 1 or 2 o-clock. Is it ok for you? Do you want to eat lunch? [R] Be-sha-a ahat or be-sha-a shtey. Beseder? Ata rotse leehol aruha tsororaim? [M] No, it’s not ok. I want to buy something now, here. I want to eat later, at 8 or 9 o’clock. Is it ok for you? [M] Lo, lo-beseder. Ani rotse liknot mashehu ahshav, po. Ani rotse leehol euter meuha, be-sha-a shmone or be-sha-a tesha. Beseder? [R] Yes, it is ok.
[M] What time is it now? I’ve just finished the first 6 lessons. Now let’s try to imagine a conversation that I would have, in order to practice my newly learned words…or at least some of them. The conversation is a bit weird, but at least it contains the words I should have learned. Also, don’t be scared about the writing – speech transcription 😦 I wish I start to learn writing soon!!! [M] Hello, Rachel! How are you? [M] Shalom, Rahel. Ma shlomeh? [R] Hey, Michael. I’m fine, thanks, and how are you? [R] Shalom, Mihael. Tov, toda, ve-ma shlomha? [R] Do you know where Isaia street is? [R] Ata iodeea eifo rehov Ieshaiau? [M] Yes, it is there. [R] Do you know where Rabin square is? Is it not here. [R] Ata iodeea eifo kikal Rabin? Ze lo po. [M] I don’t know. It is not there. [M] Ani lo iodeea. Ze lo sham. [R] I want to eat something. Do you want to eat something also? [R] Ani rotsa leehol mashehu. Ata rotse gam leehol mashehu? [M] I don’t want to eat. But I want to drink something. Where do you want to eat? [M] Ani lo rotse leehol. Aval-ani rotse lishtot mashehu. Eifo at rotsa leehol? [M] At your place? I don’t want to. [M] Ets-leh? Ani lo rotse. [R] Where do you want to drink? At your place? [R] Eifo ata rotse lishtot? Ets-ha? [M] I want to eat at my place. When do you want to eat? [M] Ani rotse leehol etsi. Matai at rotsa leehol? [R] Not now. Later. I also want to drink something, please. [R] Lo ahshav. Ioter meuha. Ani rotse gam lishtot mashehu, bevacasha. 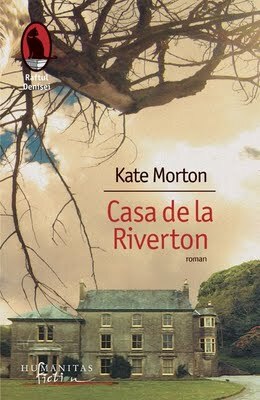 Kate Morton, care prin prima ei carte a obtinut “New York Times BestSeller”. The House At Riverton, povestea istoriei unei familiei de lorzi, vazuta prin ochii batranei arheoloage Grace Bradley, fosta camerista a celei mai mari fete a lordului Ashbury si sora nedeclarata a acesteia avuta de lord cu servitoarea de la conacul Riverton. Revine la viata abia in momentul in care se indragosteste de Robbie Hunter. De asta mi-e teama. De oamenii morti din jurul meu, dar mai ales de moartea mea. Cei trei frati, Hannah, David si Emmeline, jucau cand erau mici Jocul, prilejul lor de a visa, de a-si imagina, de a vizita lumea si de a gasi aventuri. Hannah era Nefertiti si visa sa cutreiere lumea, sa cunoasca oameni si locuri. In schimb moare, alaturi de un sot pe care nu-l iubeste si care ii limiteaza toate visurile pe care le-a avut vreodata. Oare cati dintre noi au puterea de a spune “Nu” si de a-si urma visurile? Oare cati ne oprim in noroiul civilizatiei pe care o cunoastem si ne ucidem visurile pentru iluzia unei bunastari vremelnice?